Before teaming with her best friend to found TILDEN, Laura Forman was in her element working in the cut-throat world of Wall Street. 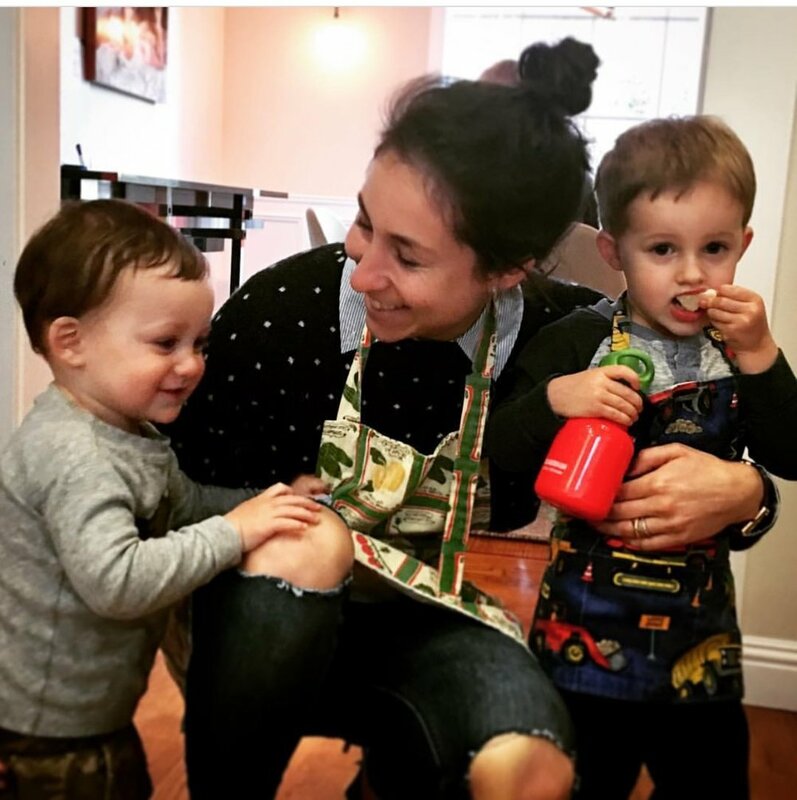 She spend a decade working in finance and, like many women, was asked the burning question by her male peers: Are you quitting work now that you're pregnant? The answer was "no," and she continued to work on the trading floors of New York until she relocated to the Bay Area. Pregnant with her second child, Forman was earning her master's degree in Data Journalism at Stanford University and spent long hours carpooling between San Francisco and Silicon Valley with friend and fellow Princeton grad Ashley Howerton. It was during those rush hour commutes when the entrepreneurial duo realized that finding the right clothing size was a challenge that all women could relate to — whether or not they were dressing a baby bump. "While motherhood — pregnancy and postpartum — means acute changes in a woman's body, the reality is that all women's bodies are dynamic, no matter what stage of life they're in," Forman explains. "Most women, pregnant or not, walk into their closets every morning and have that minute (or hour) where they wonder what, if anything, will fit them that day." "More and more, we're seeing 'personalization' in sizing, from half cup sizes for bras, 3D printing, and custom tailoring, for example," continues Forman. "Which is great the day a woman buys it. But women's bodies change daily based on exercise, diet, menstrual cycles, and pregnancy." Armed with Howerton's merchandising and operations experience at companies like Rent the Runway, GAP, and eBay and Forman's financial acumen, the women launched TILDEN two years ago. Offering luxury labels like A.L.C., Diane Von Furstenberg, Enza Costa, and more high-end designer brands, the online retailer breaks free from pregnancy sizing and instead stocks pieces that flatter all women's bodies. Curated by "Edits," TILDEN's collections include "non-maternity" pieces like Yumi Kim wrap-around dresses that are fit for baby showers and baby moons, figure-flattering Vince separates that go from the office to dinner, bump-friendly cashmere basics, and more. We recently sat down with TILDEN's COO (and Fashion Mamas San Francisco member) to find out how she went from finance to fashion. Read on below to learn all about her career journey, what she learned from working on Wall Street, how motherhood made her a better business owner, and her top advice for women seeking capital for their startup. What are the names and ages of your kids? Henry, 4 and James, 2 and a half in June. Tell us more about your career journey from finance to fashion: How'd you get to where you are today? It was actually my experience in finance that led to me to fashion. After Princeton, I spent 10 years on Wall Street, one of or the only female across the male-dominated trading floors of NYC. When I got pregnant for the first time, men immediately started asking me when I was quitting. Under normal circumstances, this would have been amusing to me, but something about being pregnant (I blame the hormones!) and my body changing constantly made me feel out of control, scared, and lost. Many days, I wanted to give up. Fashion is actually an integral part of finance culture (at least in New York). First impressions and confidence are essential to success in the business and, naturally, your clothing is one of the first things people notice when they meet you for the first time. How we look in our clothing also affects how we feel about ourselves in a powerful way. Constantly feeling like my clothes didn't fit and having to trade down from my usual wardrobe to maternity wear and fast fashion definitely affected my confidence. Some days, I wasn't sure who I was anymore. With TILDEN, I wanted to create a wardrobe for women versatile and flexible enough to flatter them every day. Walk into your closet every morning with the confidence that everything is going to fit, and you will leave the house feeling like the best version of yourself, no matter what's going on that day with your body. What inspired you to create TILDEN? It's an unfair truth that women are just hitting their stride, professionally and personally, coming into their own around the same time they are thinking about starting a family. I wanted to empower women to maintain that confidence they've worked so hard to build so that they feel like themselves as they make the tricky transition to motherhood. Maternity wear is universally hated by women. It is ugly, expensive for what it is, and unflattering. The worst part, in my opinion, is that it's only relevant for such a short period of time — at TILDEN, we call it "stage-specific." And it's often a step down from what we're usually buying because we don't want to invest in something we'll only wear a few times or for a few months. Not only is this a waste of time and money, it makes women feel less confident about the body they're in because they don't feel like themselves. When women can wear the same clothing they loved pre-pregnancy during their pregnancy, there is this continuity that is reassuring and gives them peace of mind. Yes, your body changes during pregnancy. But your identity should never have to. "When I got pregnant for the first time, men immediately started asking me when I was quitting. Under normal circumstances, this would have been amusing to me, but something about being pregnant and my body changing constantly made me feel out of control, scared, and lost. Many days, I wanted to give up." What were some of your reservations about starting your own company? I loved working at investment banks because of the inherent and established structure they provided to your career. You show up as an intern, then you're an analyst, an associate, a VP. It was very much a meritocracy. You work hard; you eat what you kill. You can move up quickly if you're hungry. You always know what you need to do to get the next level. And when you get there, you know just what to do because you've watched your superiors do it day in and day out. For me, starting a company — much like starting a family, by the way — was really a nebulous unknown. What am I supposed to do and when does it need to be done by? I've always been very deadline-driven and entrepreneurship comes with no instructions or deadlines. This was all very unnerving to me. The positive side — and I've learned this from parenting — you're the boss from day one. There is no one looking over your shoulder telling you something needs to be done differently. My co-founder and I have been fortunate enough to surround ourselves with really smart women who have been tremendously successful in their own spheres and who we've been able to turn to when we're really unsure or just for an empathetic hug along the way. It's hard, but it's also incredibly rewarding to be able to look down at your business from 10,000 feet and think, Wow, we built this. And it doesn't hurt to work with a best friend. As a woman, what surprised you about moving into the fashion industry? Coming to fashion from Wall Street, I thought I'd be moving to a female-dominated industry, and that that would be a refreshing change. What's interesting about fashion is that, although it is flooded with women in the lower and mid-levels, the majority of fashion companies are actually run by men. Vanessa Friedman, who covers fashion for the NY Times, ran a piece a few weeks back called "Fashion's Woman Problem" examining why men are still running a female-dominated industry. Sizing is broken is women's fashion, and, yes, some of that has to do with economics; but much of it has to do with this gender mis-match in the industry. Men can pull on the same pair of pants every day for 10 years and not have a problem. Women live a very different reality and it's really time the industry started paying attention. What were some of the invaluable lessons you learned when starting your own business? Number one: You're going to fail before you succeed. Most people start business because their previous experiences have given them the confidence to be reasonably certain they'll succeed on their own. Entrepreneurship is all about failing to succeed. Lesson two, you really have to trust your gut. When you're accustomed to taking direction from someone else, this is a really big change. Remember that it's your business. Ask for advice and you'll always get ten different "right" answers. The right answer for you is whatever you decide. How do you define your own style? I'm from San Diego and I spent 10 years on the East Coast for college and NYC for work. Now in the bay area, my style is really a blend of the two. When I'm working, I'm wearing all black. When I'm at home, it's distressed denim. With kids, I feel like I'm constantly running around and time is always of the essence. So, I'm super into platform flats or sandals rather than heels. Work uniform: skinny jeans, silk top, blazer. Home uniform: Long maxi, oversized distressed denim jacket. Mascara, tinted moisturizer. Chapstick. Out the door. How do you carve out time for self-care? It's really important to me, especially as a working mom, to make sure I'm spending at least an hour a day thinking about myself and what I need to perform both at work and at home. It's ironic that when mothers neglect themselves in favor of others, they actually become worse at caretaking because they're unhappy with themselves. There is always guilt that comes with self-care, whether or not you're a mom. Should I take that vacation or will I miss out on a promotion? Should I go for a run and miss bedtime with my child? My husband got me into transcendental meditation which teaches you that taking the 20 minutes out of your day to meditate might seem impossible, but the reality is that you will become so much more productive from having taken that break that you actually don't have time NOT to meditate. I think that lesson translates well to self-care. What did you learn from fundraising on Wall Street, and how have your skills played a role in getting funding for TILDEN? Fundraising for a living has taught me aggression, hustle, and how to read an audience. You definitely want to play up different aspects of your business depending upon who it is you're trying to reach. My previous experience on Wall Street revolved around public companies. These are much later stage than we are, obviously — most of them had several million to multiple billion dollar market caps. I'd never actually worked with venture capital before, only hedge funds and mutual funds; so this has been a big change and learning experience for me, just like most first time entrepreneurs. Thus far, we've actually been self-funded with the exception of a small friends and family round we took on a few months ago. What are your top tips for burgeoning businesses looking for funding? No matter how successful you may have been in your previous career, fundraising is universally humbling! Hang in there! Follow TILDEN at @shoptilden and shop online here.